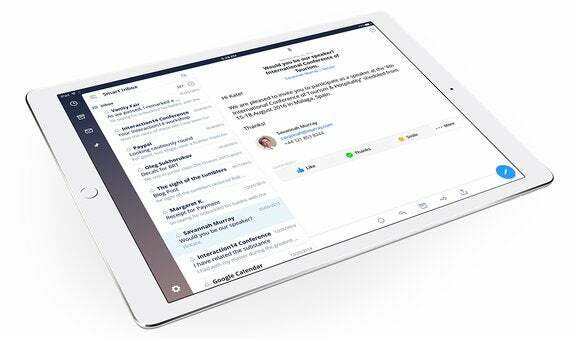 Now that Mailbox is gone, what's an iOS power user to do? 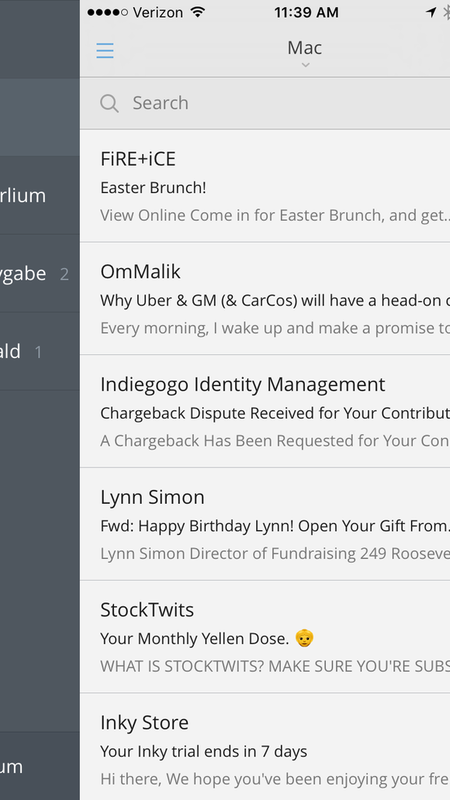 A year ago, Orchestra Inc’s Mailbox was the clear leader, but even if it hadn’t shut down last month, retaining its top spot would have been difficult. Today’s great email clients go beyond simply separating the messages that need your immediate attention from the ones that don’t. 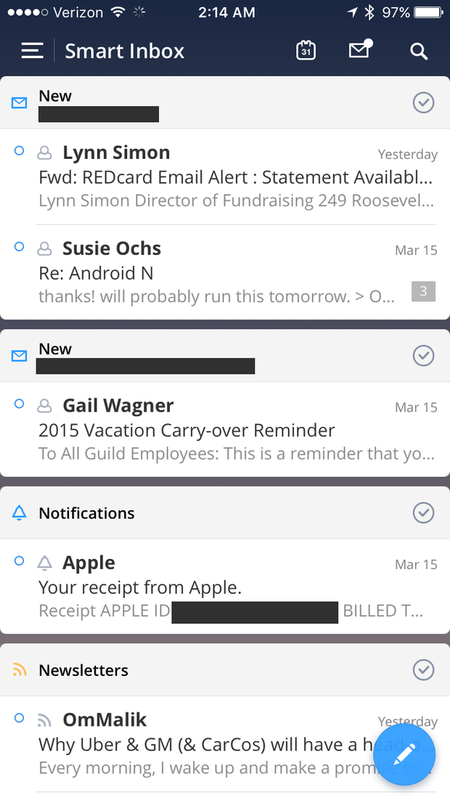 Before you can attack your inbox, you need a client that makes you want to spend time with it, and developers have elevated their mobile email clients beyond what desktop apps can offer, with rich, gesture-heavy interfaces perfect for Multi-Touch screens. iPhone users of a certain generation can remember the day Sparrow landed in the App Store. Following in the footsteps of its stellar desktop app, Sparrow was sadly shut down before it had a chance to truly spread its wings. But you need look no further than Spark (free in the App Store) to see what it could have become. Spark's inbox is smarter than the average bear. It’s not that Spark is derivative of Sparrow, more that it’s just as ambitious. Developed by Readdle, Spark understands productivity in a way few other email apps do, giving a sense of clarity to your inbox even before you start jettisoning emails to the future or the trash. It starts with the smart inbox, an option in the sidebar that automatically filters your unread emails into a separate space. 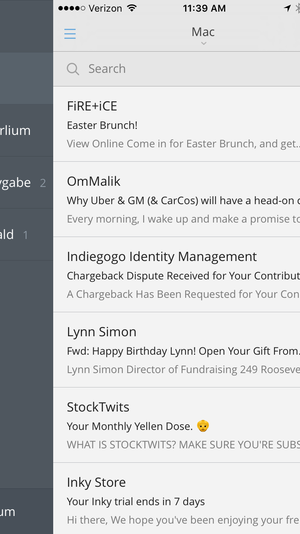 Similarly, newsletters and promotions are separated from personal messages so you can instantly see what’s important. 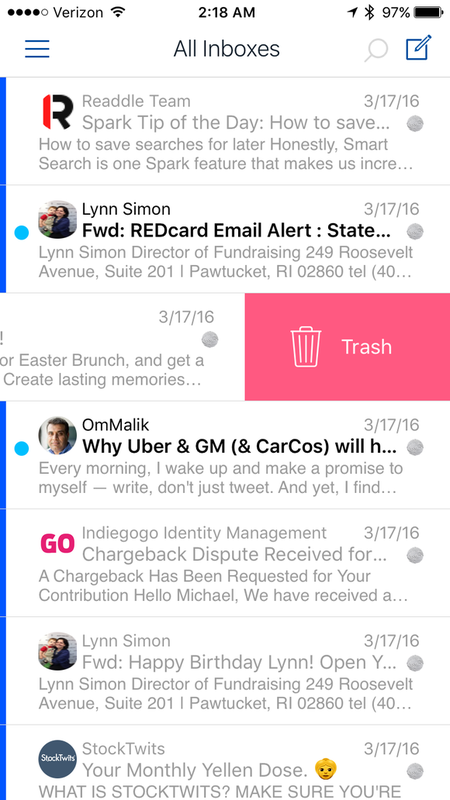 Spark’s smart inbox isn’t just about organization. By utilizing a card system, you can act on bunches of emails at once, deleting, snoozing, or pinning blocks of messages with a single swipe. 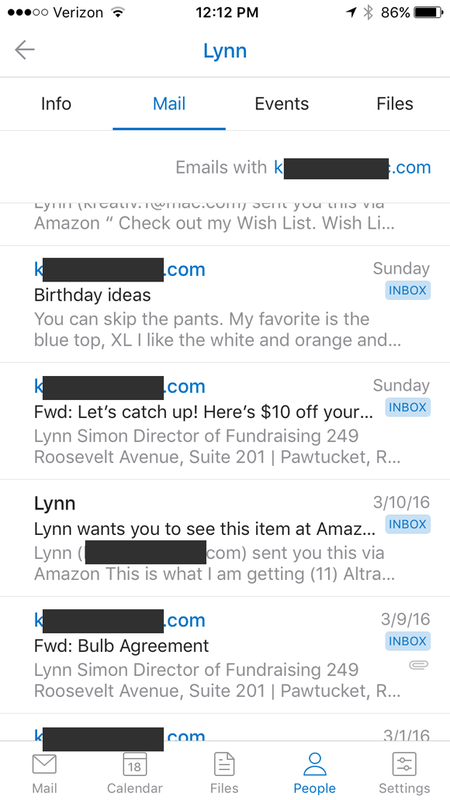 You can navigate between individual messages by swiping left or right, a small time-saver that makes a big difference when churning through a crowded inbox. Spark even lets you dial down notifications to just the emails it thinks are important, kind of like how Mail separates VIPs from the rest of pack, only you don’t have to manually flag the worthy contacts. 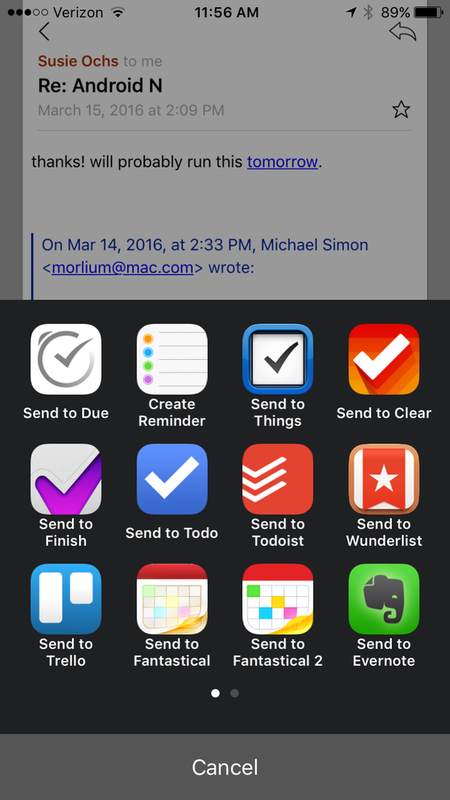 If you miss Mailbox's scheduling and snoozing, Spark will get you back on the path to Inbox Zero. But Spark’s smarts don’t stop there. The app connects to all of the major cloud services (Dropbox, iCloud Drive, OneDrive, Evernote, etc. ), so you can attach and save files with ease, while slick Pocket compatibility lets you save links for later reading. A Fantastical-like natural search engine even amplifies your searches, helping you find messages and attachments more accurately, and you can save frequent searches. The composing process is just as pleasant, with clear buttons to add attachments and photos, and after you send a message, an undo button gives you five seconds to change your mind and prevent it from being delivered. Spark isn’t lacking in the looks department, either. A slide-out sidebar set against a sky-colored gradient keeps your accounts, folders, and cards organized, and you can access your smart inbox and attachments here as well. 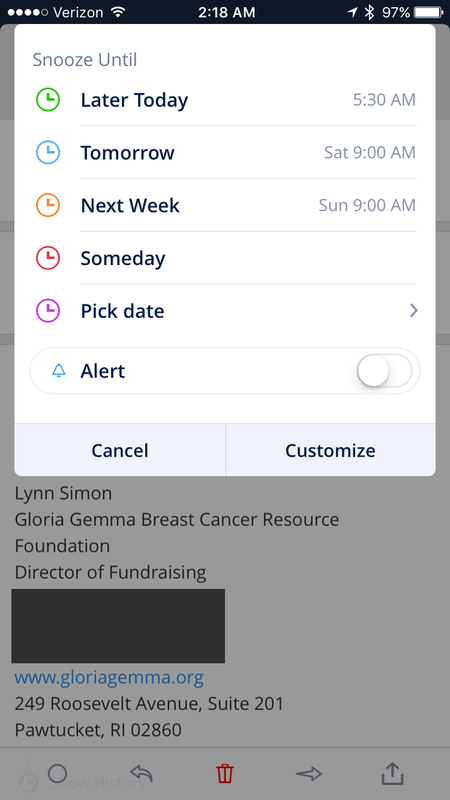 Above your inbox, Spark’s family of tiny widgets can give you quick access to your appointments on the built-in calendar, or provide a shortcut to one of your favorite folders. Spark’s interface is extremely customizable, from the widgets to the cards to the swipes. Things can be tweaked, shifted, or removed altogether, making Spark one of the fastest and most adaptable clients I’ve used. It can operate under the common “Inbox Zero” rules of snoozing and archiving, but what makes Spark superior is how it doesn’t force you into any one method. It simply gives you the control you need to properly manage your messages. 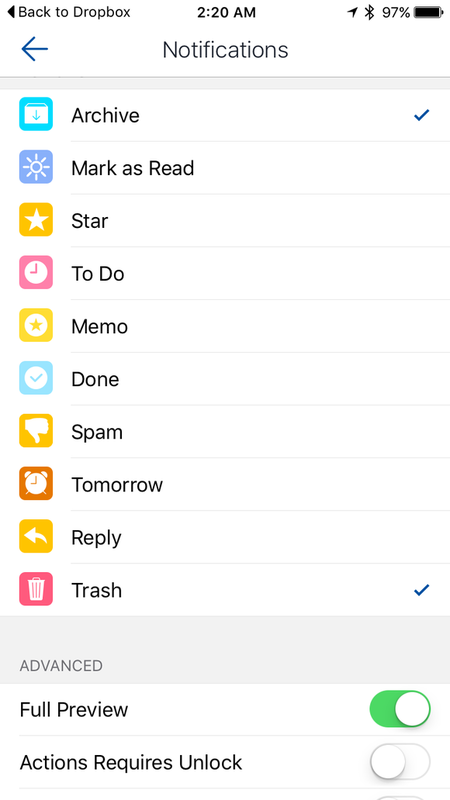 Most modern email apps allow a certain level of customization, letting you adjust the behavior of gestures and swipes, set alert sounds for each mail account, even tweak accent colors and avatars. But even if you were to combine every option in every email client mentioned here into some kind of super settings, it likely still wouldn’t be able to measure up to the amazing personalization of Airmail ($5 in the App Store). Everything about Airmail's interface can be tweaked, from the swipes to the filters. On the surface, Airmail is little more than a good-looking mobile client that relies on common organization methods to manage your inbox. Buttons at the bottom of the screen provide one-touch filtering, letting you dial down your messages to just the ones containing attachments or only those that are part of a conversation thread. But nothing about them is particularly innovative. In fact, it wasn’t until I looked for a way to hide those buttons when I discovered Airmail’s true power. Tapping on the settings button in Airmail’s sidebar is like opening a whole new app. Where other apps more or less force you to learn their way of doing things, Airmail’s default interface is merely a suggestion. You can customize everything from the appearance to the swipes, snoozes, and services, and it’ll probably take days, if not weeks, before you settle on the perfect combination. There are so many actions and options to choose from, it looks more like an automation app than an email client. Many of the apps here use iCloud sync to keep versions in sync, but what Airmail offers is significantly more powerful than an on-off switch. Not only can you choose specific accounts to sync, you can get downright forensic with what gets sent to the cloud. Every single setting has its own toggle, so if you want to sync your right-swipe setting but not your left one, Airmail can accommodate that. Airmail has more options for its notifications than some email clients have for their whole app. Speaking of swipes, there’s no shortage of ways to customize them, with more than a dozen individual actions, from archiving a message to shipping it off to another app. 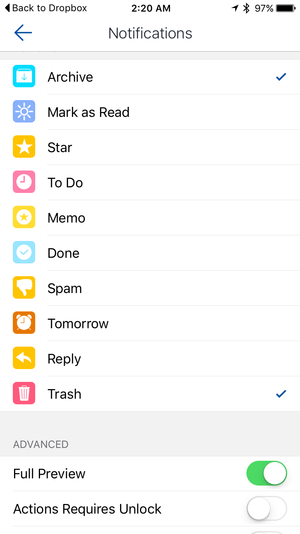 The same goes for interactive notifications, which feature an array of options that go far beyond the usual “mark as read” and “send to trash” choices. For power users, Airmail connects to some 30 apps and services, letting you hook up with your Dropbox, Google, and Box, while also saving links to Pocket or sending snippets of text to Evernote and Editorial. For serial organizers, it offers tremendous control over folder mapping, and you can assign labels for just about everything. Additionally, it lets you set limits on automatic downloading for attachments, change the counter shown on the badge, and set aliases. And if you want to just turn off the filters, you can do that, too. Airmail might not have a have-to-try feature that will lure people to download it, but its distinction isn’t in what it does, it’s in what it allows you to do. As an email client, it won’t introduce anything that changes your routine, but it will give you the tools you need to set up your dream inbox, no matter how many messages you want to keep in it. Mailbox’s popularity wasn’t just about clean inboxes. Along with its scheduling prowess came a beautiful design that was minimal yet functional. If you’ve been searching for something similar, CloudMagic (free in the App Store) is every bit as light and airy as its name suggests. If you’re looking for a clean, minimal inbox, CloudMagic won’t disappoint. CloudMagic understands that minimalism is about more than sparsity, and its interface doesn’t make you hunt to find any of its features. The elegant typography and layout give the app a natural, logical feel that works well at a glance. 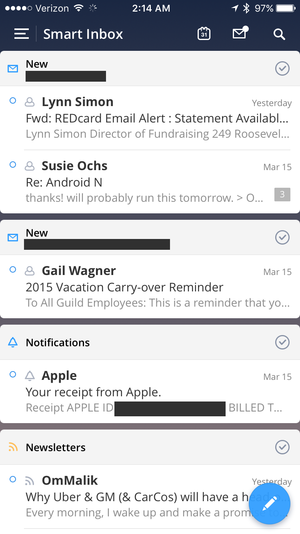 For example, when you’re in the unified inbox, strips of color delineate your accounts, a subtle way to separate messages without adding distraction. Even with limited customization and the vaguest sense of Inbox Zero, CloudMagic manages to provide order to your email. It dispenses of things like snoozing and scheduling in favor of smart integration with the other productivity apps and services you already use. With just a tap or two, you can set a due date in Todoist or add to a Trello list without having to bounce back and forth between the two apps. But the real magic comes from its smart interface. By putting a premium on simplicity, CloudMagic helps you navigate your inbox without crowding the screen with unnecessary buttons—only what’s essential. Microsoft’s Outlook desktop app has always been the first name in enterprise email. Even more than professional features like calendar and Office integration, seamless syncing, and top-notch organization, Outlook has always brought the privacy and security that businesses crave. Outlook’s “People” tab is more than an address book—it’s like a file cabinet for your contacts. And the mobile Outlook app (free in the App Store) continues in that vein. While some users questioned its commitment to security when it merged Accompli and Sunrise into Outlook mobile, Microsoft hasn’t fallen asleep at the wheel. A series of steady upgrades have brought important features like multi-factor authentication and OAuth for Office 365 accounts, as well as mobile device and application management capabilities. And the most recent update added Touch ID support for an extra level of on-device privacy. And Outlook on iOS isn’t lacking in professional features either. A clean, focused inbox puts important messages front and center, while a dedicated tab lets you easily browse attachments as well as files stored in cloud drives. A full calendar lets you see your schedule, add events and RSVP to invites without even opening the message, while a handy in-app address book filters messages, events, and files by sender. Let’s face it, the majority of people aren’t actively working to achieve Inbox Zero. Most of us never see the bottom of our inboxes, drowning in the mostly unread promos, newsletters, and announcements that flood our accounts each day. 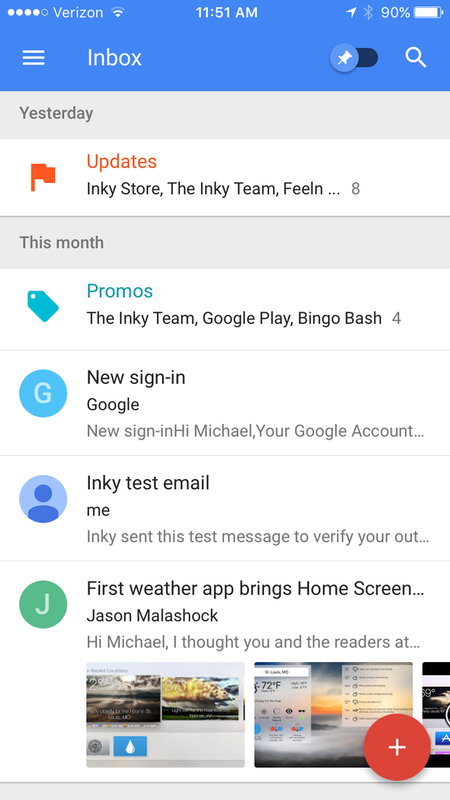 While other clients here attempt to solve this by shielding them from view, Google has taken a more organizational approach to the problem with Inbox (free in the App Store). Google’s Inbox takes some getting used to, but it’s the best way to keep your Gmail account organized. 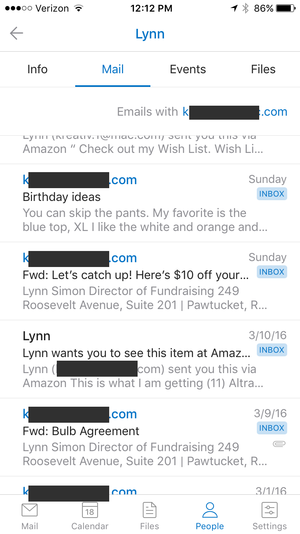 Instead of having you sift through a massive container of emails, Inbox sorts your messages into bundles. Things like promos, purchases, and trips are all automatically sorted as they arrive, and even personal messages are arranged by time. You can also create your own groups based on a variety of criteria, and since Inbox doesn’t hide these messages from view, you’ll be more likely to see and act on them. Inbox also supports snoozing and scheduling, as well as a smart toggle that collects any messages you’ve pinned, but it’s most effective when you let it do the heavy lifting for you. After all, since Google is to blame for much of the targeted advertising we receive anyway, it’s only natural that Google would find the best way to deal with it. Even if you dutifully empty your inbox every day, eventually you’re going to have to act on all those snoozed and scheduled messages. Many of the apps here will let you schedule events and reminders, even set to-dos, but if you have serious work to do in your inbox, Dispatch ($7 in the App Store) is the only one you can count on to make sure every last thing gets done. Dispatch will help you clean your inbox with a purpose. Dispatch is about actions. The usual ones are here via swipes and buttons, but it goes much further than simple replies. 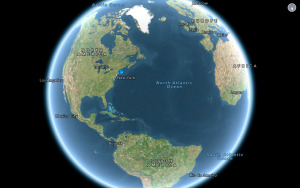 The app acts like more of a hub than an email client, connecting to dozens of popular apps ready to do your bidding. Every message has the potential to be transformed into something more specific, whether that’s a task for Clear, a note in Drafts, or a reminder for Fantastical. The precise wording can be edited within the app and shipped off in seconds, letting you quickly get to work on the next message. And if all you need to do is reply, Dispatch even does than with efficiency, storing snippets of text that can be accessed and pasted into messages to cut down on repetition. Dispatch might not get you to Inbox Zero quicker than the other clients here, but it’ll be much more satisfying than merely filing away your messages until a later date. While the email apps here run the gamut of what can be done with an inbox, there are many more excellent options available in the App Store.